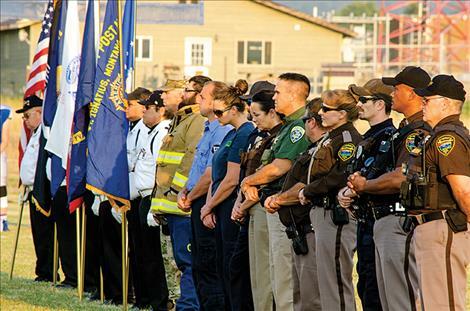 The Mission Valley Honor Guard, local law enforcement, firefighters, emergency responders and soldiers remember the heroes of 9/11 before a football game on Friday. The Mission Valley Honor Guard presents the colors. 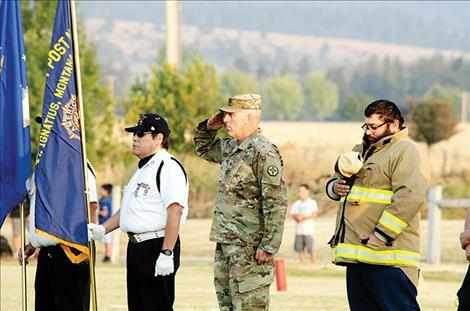 Army Reserve soldier Paul Adams salutes the flag. 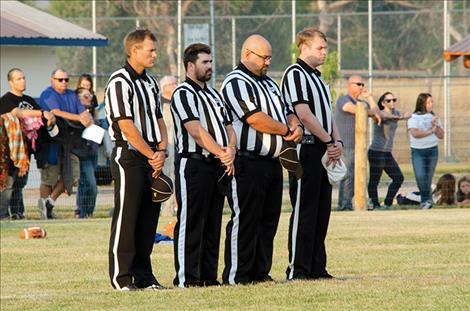 Football referees honor the heroes. 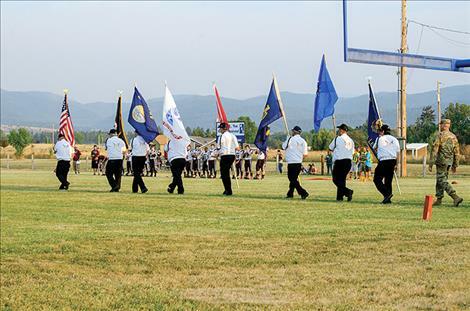 ST. IGNATIUS – Local police, firefighters, emergency responders, and a soldier followed the Mission Valley Honor Guard onto the football field to honor the heroes of Sept. 11 during a ceremony before the Friday evening game. The Mission Valley Honor Guard brings people together almost every year for the ceremony. 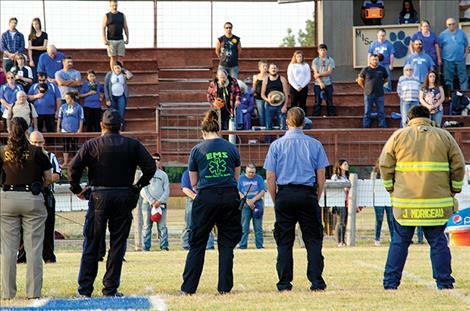 Football players, referees, and spectators stood quietly while announcer Stuart Morton read a document from the Guard outlining the events of 9/11. Army Reserve soldier Paul Adams was with the lineup on the field. 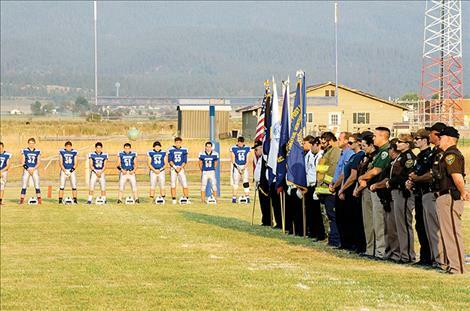 He was thanked for currently serving in the military. 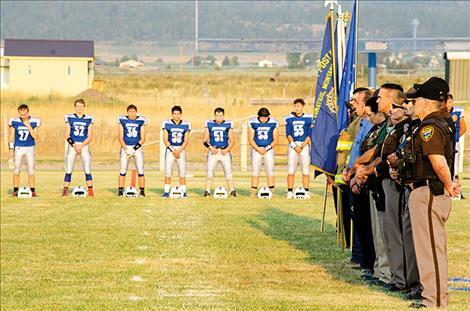 He graduated from Polson High School and lives in St. Ignatius with his family. 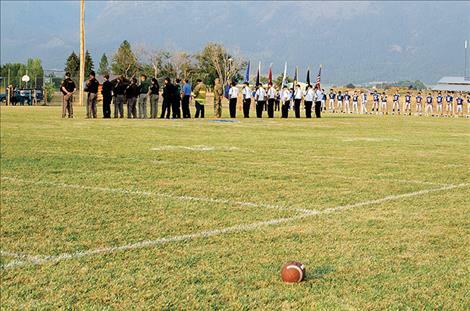 He later watched his sons play for the Mission football team during the game. Adams is being deployed to Kuwait in October. After 25 years in the military, Adams said he hopes to retire after he gets back from his fourth deployment.